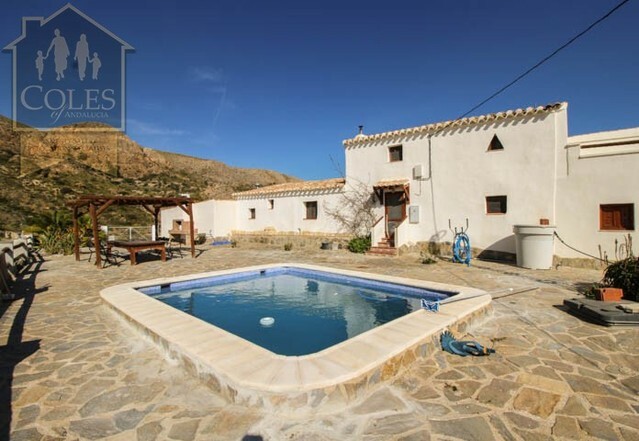 A detached 4 bedroom 3 bathroom cortijo measuring 266m² in Alfaix, near Los Gallardos, set within a plot of over 47,000m² with bespoke 10 x 5m pool, garage/workshop, outbuildings, well and fantastic mountain views. This modern cortijo with traditional features is located in the small hamlet of Alfaix, 10km from the larger town of Los Gallardos. Amenities in Alfaix include a bar, general store, doctor´s surgery, bar/restaurant and small supermarket, with more amenities found in Los Gallardos. The bustling beach front of Mojacar is just a 15-20 minute drive away, whilst the nearest airport is approximately 40 minutes drive away in Almeria. This extremely impressive home really does have the wow factor in terms of size, presentation and views! The access is excellent, with tarmac all the way to the main gates. 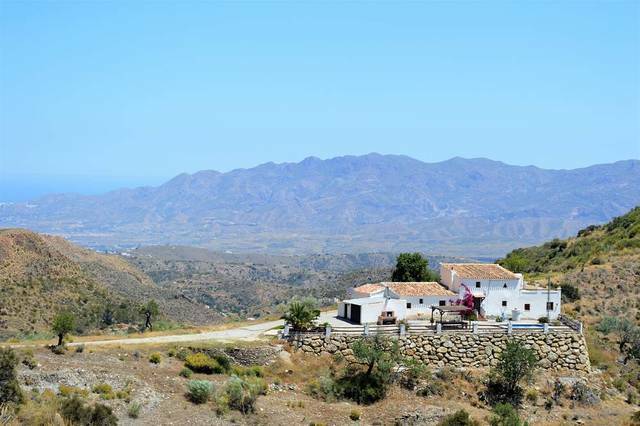 The huge plot of 47,276m² is fully fenced and offers magnificent views of the Sierra Cabrera mountain range. The land rolls down the valley with many established trees, including olive trees. The property is connected to mains water & electricity, but there is also an old well and irrigation water deposit and pump house on the land. As you pass through the main gates a long sweeping driveway leads around the house & pool to the rear of the property with space for parking several cars as well as the detached garage/workshop measuring 35m². The grand double door entrance to the villa can be found at the rear and this opens into a hallway. A long covered terrace with BBQ & outdoor kitchen can be found across the front of the villa, and this terrace boasts colourful bougainvillea climbing the pillars and growing across the terracing. This terrace can be accessed via the kitchen and the master bedroom through patio doors. The first set of doors lead into the huge Andalusian-style kitchen/diner with open plan kitchen, large gas range cooker and breakfast bar which wraps around to create the formal dining space with dining table & chairs. This room also benefits from two sets of ceiling fans and glazed double doors lead from here into the entrance hallway. Ahead is the main front door, with a store cupboard on the left. The hallway boasts traditional Andalusian wall tiles halfway up the walls, along with other traditional Spanish features. On the right a door opens into the lounge with grand feature fireplace with log burning stove and two ceiling fans. Along the hallway and on the left are the bedrooms and bathrooms. The vast second bedroom is first on the left with an en-suite shower room, walk-in wardrobe, ceiling fan and patio doors out to the pool terrace. Opposite is the third bedroom with walk-in wardrobe and ceiling fan. Further along on the right is the fourth bedroom, also with ceiling fan. The family bathroom is found at the end of the hallway with full bath and a separate shower cubicle. The layout is completed by the master bedroom with an en-suite shower room, ceiling fan, fitted wardrobes and patio doors out to the pool area & terrace. In summary, this is a truly stunning home which is built & presented to the highest quality. The current owners have incorporated such attention to detail, combining traditional Spanish features and modern building standards.